We’ve seen an array of solar-powered battery chargers, but the HyMini takes wind power to a whole new portable level. This cute little personal wind turbine can be hooked up to various devices to charge your phones, cameras, and other small electronics when you are on the go: walking around, driving or even riding your bike. It’s perfect for camping and outdoorsy activities, as well as those days when you are traveling: in and out of trains, cabs, or airports. Better yet, it can be combine with solar panels or even charged from a regular electrical outlet (for a bit of redundancy) when there is just no wind around. The Rocco is pretty cool. Transforming children’s physical activity into electrical power at home is brilliant. It’s beneficial in many ways: physical activity that benefits the body and educational, teaching a child how their own actions can create good things. Older kids would probably like it for its science and environment-friendly aspects. As a child, I saw and experienced similar prototypes at the Toronto Science Center – bicycle powered generators. Now, a person can really have something similar at home. It’s taken a long time to produce an affordable item. What I love about the Rocco is that a child who can’t pedal, can still generate electricity while having fun and physical activity. It also illustrates that there are unique alternatives to producing energy for use at home. I’d love to have the HyMini to charge my camera’s batteries while I’m hiking and photographing outdoors. And I love that I would have one less thing to plug into our energy grid. Interesting how you recommend bamboo instead of plastic. You would have to cut down millions of bamboo to produce a bamboo gadget, which would be covered with a film of some sort to keep it from from breaking which would be made out of the similar chemicals as that plastic container. It takes 4x as much energy to make something out of wood or paper as it does plastic. And in the end of the day, the plastic could be recycled. Soon most plastics will be made out of corn oil which will cost just as must to manufacter as other plastics. I just logged into their website (www.hymini.com) as soon as i see the product on Q magazine (Jan. 2008). I remember i observed the gadget and then i logged off. But now their site don't work. Strange! Was it bogus? Maybe if you use this every minute of every day for the rest of your life it will cover its own carbon footprint. Not sold yet. Needs to be designed to be more functional. but it's pure plastic! what are they thinking? Form Follows Function Failure! How much greenwash will you folks swallow before you start to choke??? Who wants to hand hold this thing in the wind long enough to charge any appliance? Thanks to it's sleek round edge, you can't even stand this thing up! A clumsy bike mount is only available as an extra cost option. Then there's another mind boggling device for cinching a bracket to your bicept that would be more useful for shooting smack than charging your cell phone! Whoever designed this was likely motivated by sales potential and not by functionality or concern for our environment. This is a nice design, but the prices on the hand crank flashlights/generators are dropping fast. I recently picked up a 3 LED flashlight with a 5 volt charger connection for less than ten dollars. Questions as their website doesn't seem overly informative... - is the internal battery replaceable? - does the spinning fan make any noise? - is it strickly compatible with USB charged devices? Brilliant, I will bye 5 at once. We've seen an array of solar-powered battery chargers, but the HyMini takes wind power to a whole new portable level. 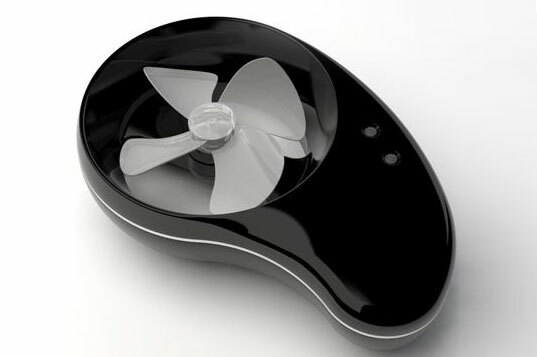 This cute little personal wind turbine can be hooked up to various devices to charge your phones, cameras, and other small electronics when you are on the go: walking around, driving or even riding your bike.